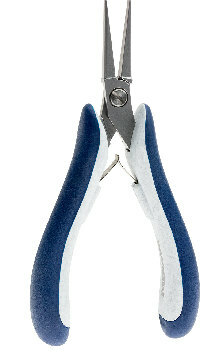 Designed and manufactured in Switzerland,these pliers meet the demanding needs of jewlery manufacturers, bench jewelers and creative professionals. Slim Ergonomic hand grips * Smooth,non-glare satin finish * Stainless Steel dual leaf return spring * Lap joing with screw for strength and perfect blade alignment. Long (30 mm), flat jaws provide maximum surface area for chainmaille work as well as forming and bending sheet metal and heavy gauges of wire. NOTE: This item has been discontinued. Stock will be available until our inventory is depleted.